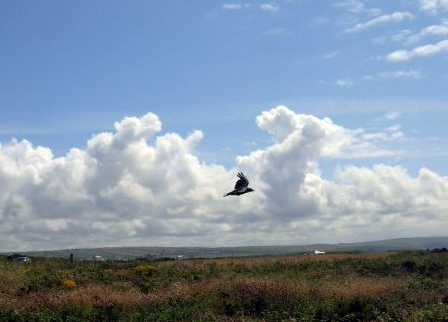 This photo of a corvid on the wing over open countryside was taken by Rose Dixon. She said: "People said that it looks like a witch on a broomstick or a rabbit on a magic carpet, but it is a Cornish raven!" What a lovely sight and a great picture. Rose, thanks very much for letting me use it on my blog. I'm going to a bird of prey centre today myself and hope to take some more photographs of birds. My Pagan Eye posts show photos that I find interesting - seasonal images, pagan sites, events, or just pretty pictures. If you want to send me a photo for a Pagan Eye post, please email it to badwitch1234@gmail.com. Let me know what the photo shows and whether you want your name mentioned or not. For copyright reasons, the photo must be one you have taken yourself. The photo is copyright Rose Dixon and should not be copied or used without her permission. I can totally see the rabbit on the broomstick!